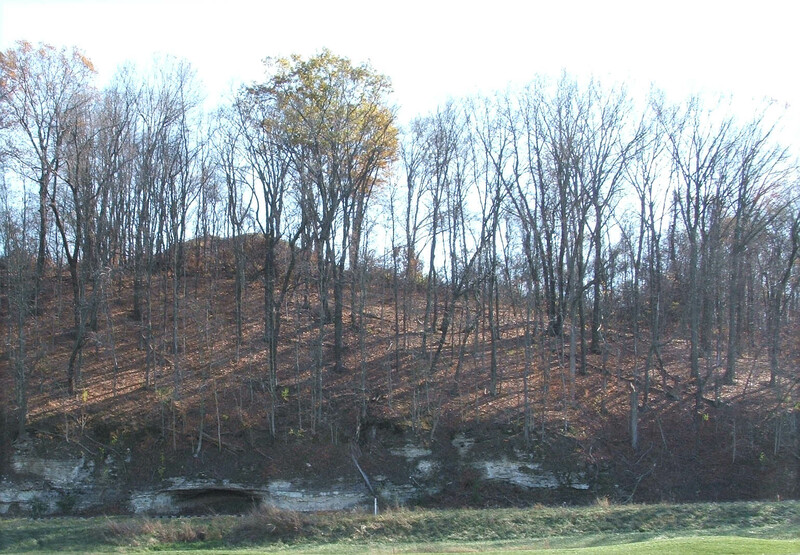 The Blake Mound archaeological site (23SL51) was discovered and reported to the Archaeological Survey of Missouri by Leonard Blake during the 1950s. His survey led to the site being placed on the National Register of Historic Places as part of an Archaeological District. 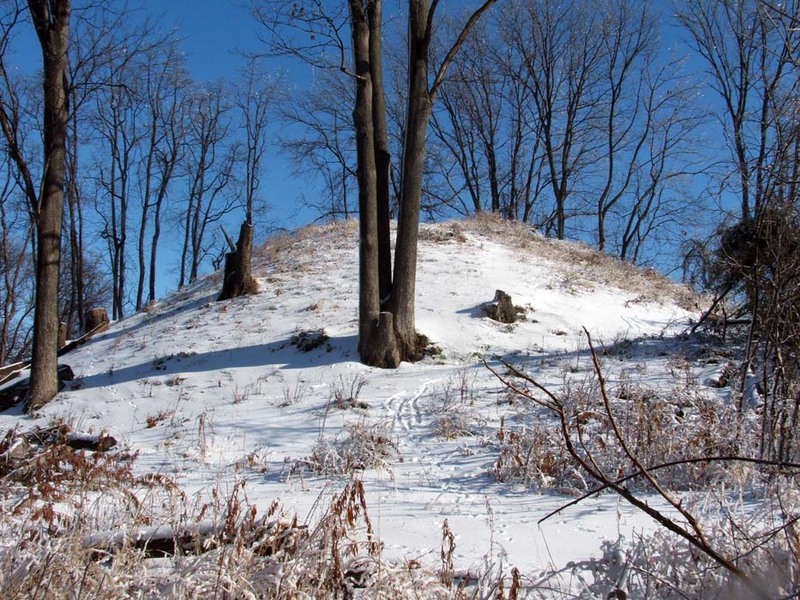 Acting upon the recommendations of Joe Harl (Archaeological Research Center of St. Louis), the property owner agreed to form a protective covenant with the State of Missouri, promising never to build on, nor destroy the mound. The site IS NOT open to the public. Blake Mound from the Missouri River floodplain before efforts to repair the looting (the prominent notch in the center of the mound). 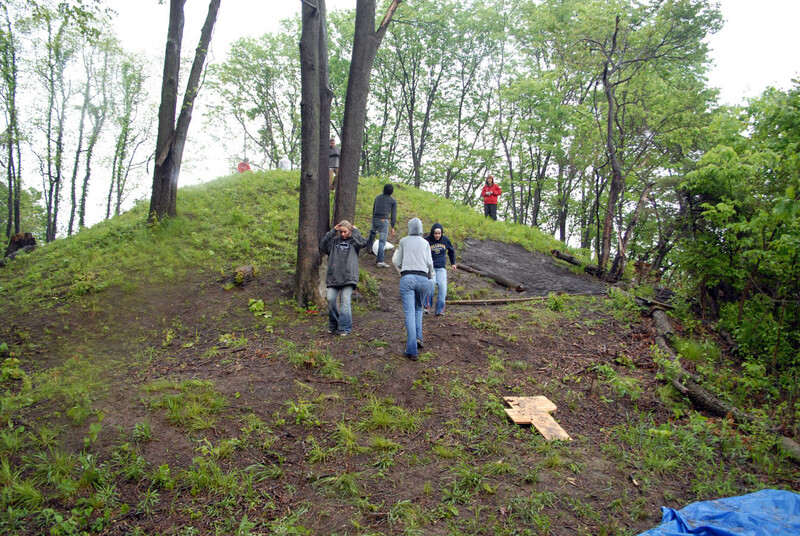 Students from St. Louis Community College help repair Blake Mound in the rain on April 29, 2006. Mark Leach spearheads the restoration of Blake Mound, coordinates the volunteers, purchases the fill soil, and carries his share of dirt. 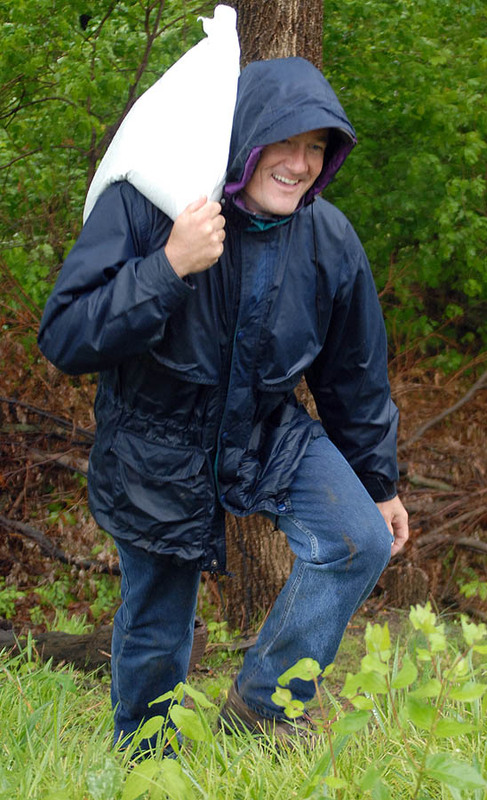 Professor Blalock (History) and Fuller (Anthropology) encourage St. Louis Community College students as they carry soil to stabilize and repair looter pits (dark patch behind Professor Fuller) at the Blake Mound site. 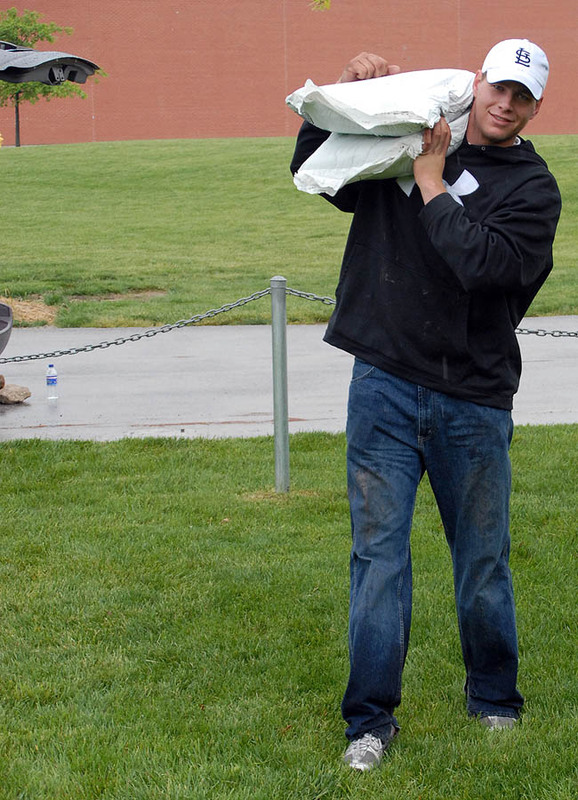 Ben Sherman, a St. Louis Commmunity College student, carries 80 pounds of dirt to repair Blake Mound. 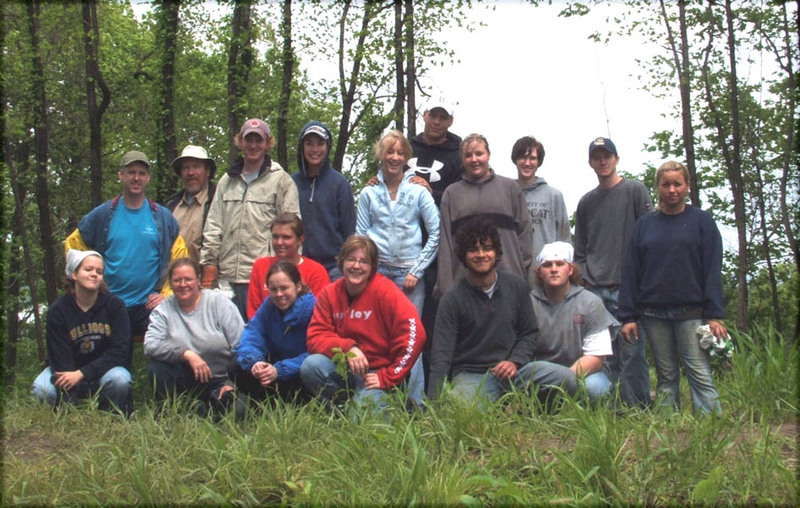 A St. Louis Commmunity College students and faculty who lasted the day of volunteering in the rain at the Blake Mound site. Photograph by Mark Leach. 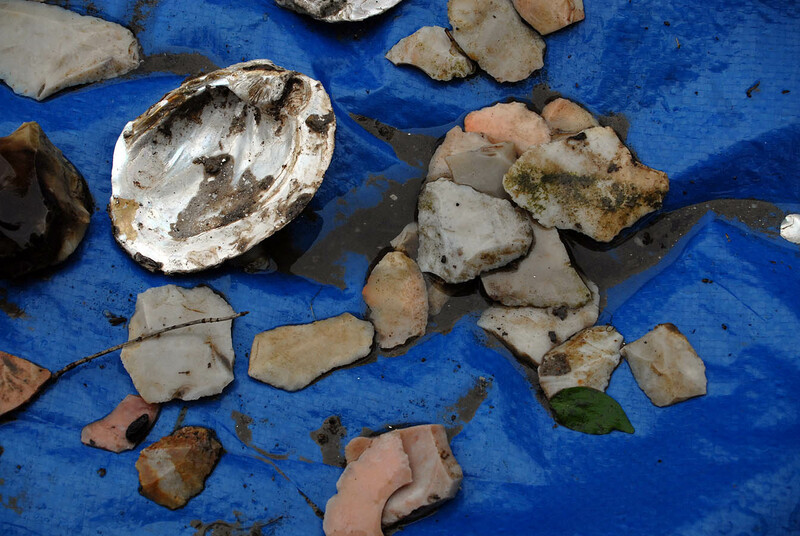 Chert waste flakes and freshwater mussel shells from the village fill around Blake Mound. 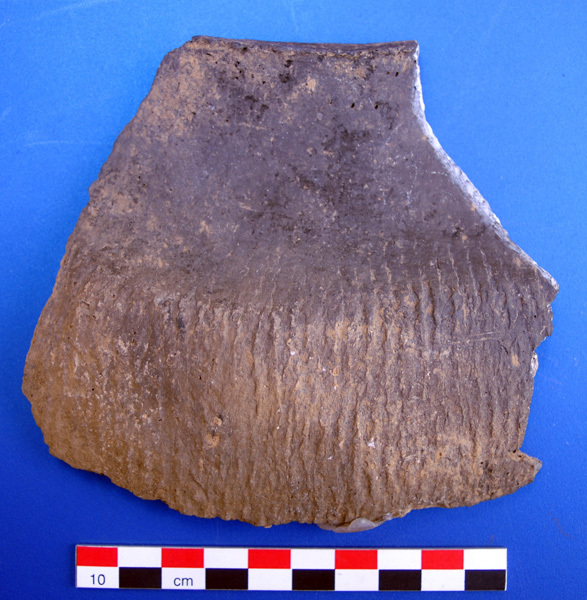 Ramey Incised rimsherd from feature no. 140 found in association with a mortuary house at the Blake Mound site by Joe Harl. Ramey Incised pottery associates with the Stirling Phase (AD 1100 to 1200) and Moorehead Phase (AD 1200 to 1275) at Cahokia Mounds in Illinois. 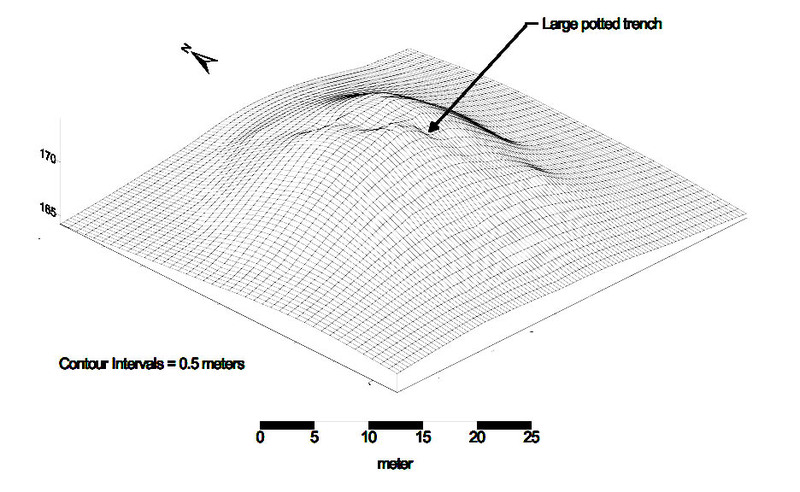 Same as the sherd drawing published by Leach (2005:Figure 7). This specimen was discovered during 1994 as a result the rescue excavation by University of Missouri at St. Louis of the village at the foot of Blake Mound. 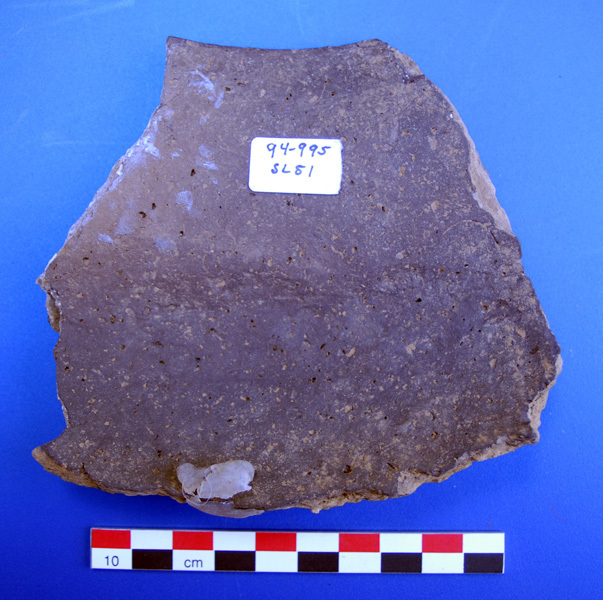 Cordmarked, shell tempered sherd with neck smoothing that Joe Harl classified as Emergent Mississippian (approximately A.D. 800-850) at 23SL51. This specimen was discovered during 1994 as a result of the rescue excavation by University of Missouri at St. Louis of the village at the foot of Blake Mound. 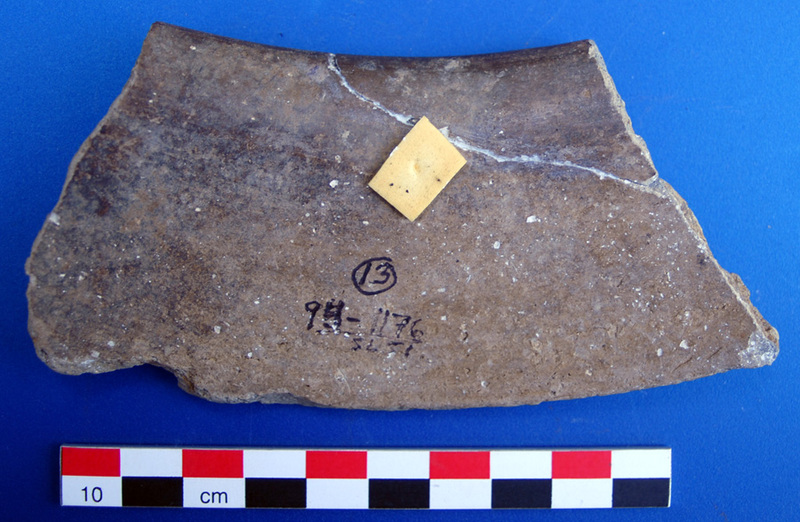 Sharpened bone awl discovered by the University of Missouri - St. Louis rescue excavation directed by Joe Harl at 23SL51. This specimen was discovered during 1994 in feature 1932. 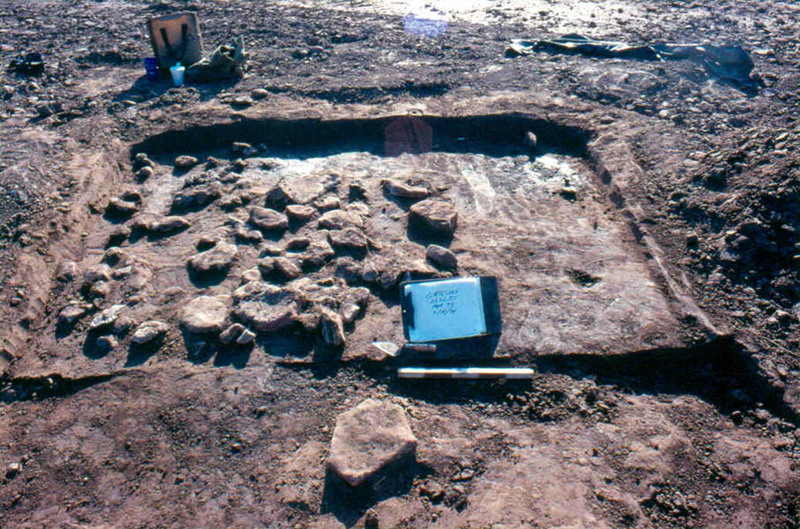 Outline and floor of a mortuary house (structure number 7) at the Blake Mound site; excavation and photograph by Joe Harl. The numerous pieces of limestone on the northern half of the floor are interpreted by Harl as pedestals where human bodies were placed or altars where food offerings or figurines were placed (Leach 2005:18). 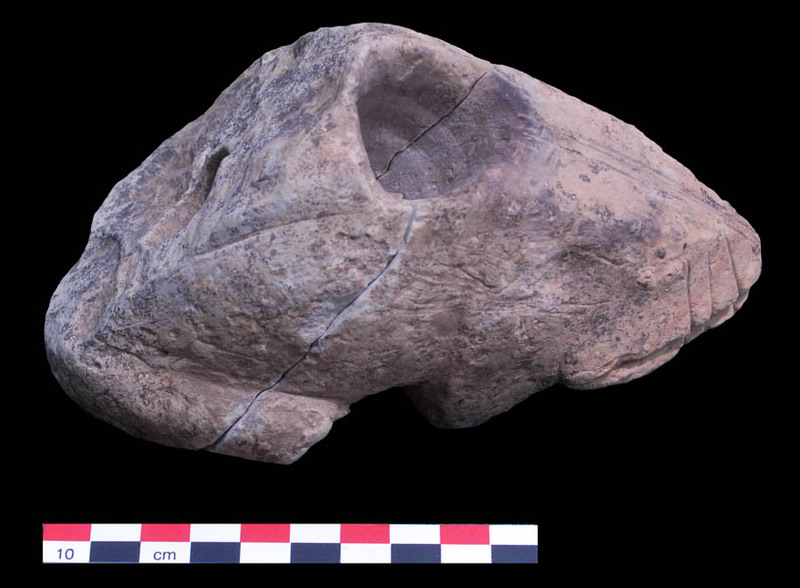 Frog effigy pipe carved from limestone discovered during archaeological testing near Blake Mound. The pipe measures 150.8 mm in length, 81.0 mm in height and 99.2 mm in width. It weighs 715.8 grams. The drilled hole in the upper back of the pipe measures 31.7 mm while the drilled hole in the lower back (used for the stem) measures 25.4 mm. Exterior color of the pipe is pink (7.5YR7/4) while the interior of the pipe is light gray (10YR7/2) in color. 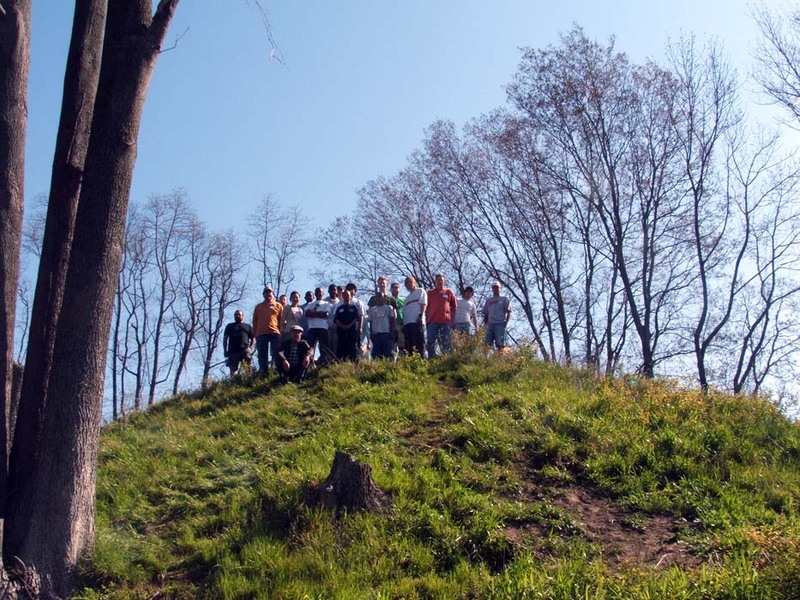 The first step of the restoration was to document the pre-restoration condition of the mound. 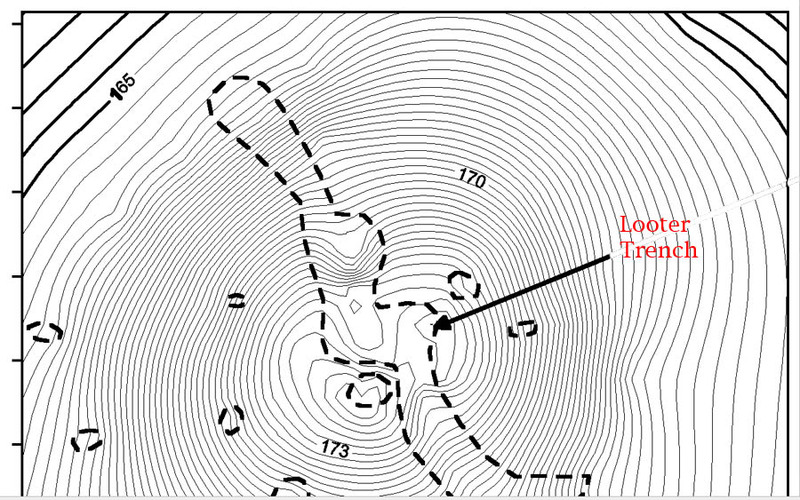 Kathleen Stahlman of PARC (Powell Archaeological Research Center) and Robin Machiran (lecturer in Archaeology at the University of Missouri - St. Louis) used a combination of GPS and Total Station equipment to map the mound. 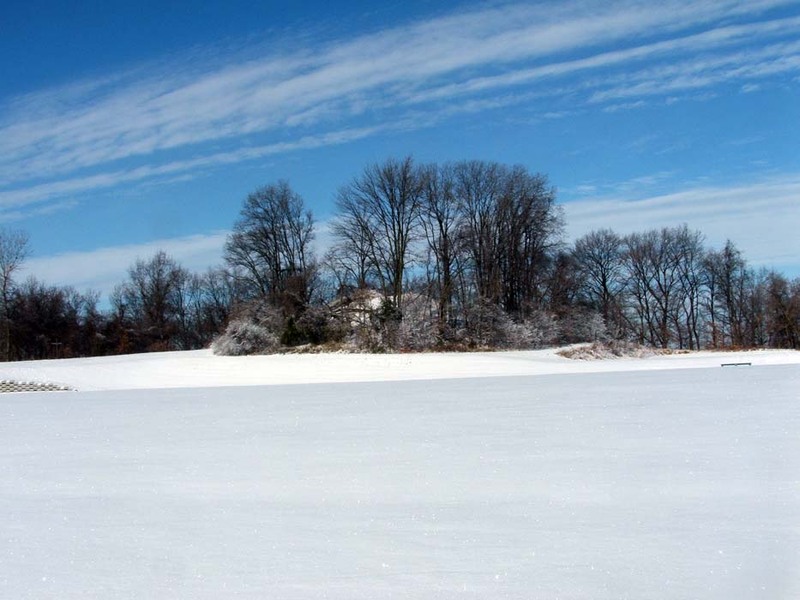 Blake Mound on the day of the ice storm, winter 2006. Photograph by Mark Leach. 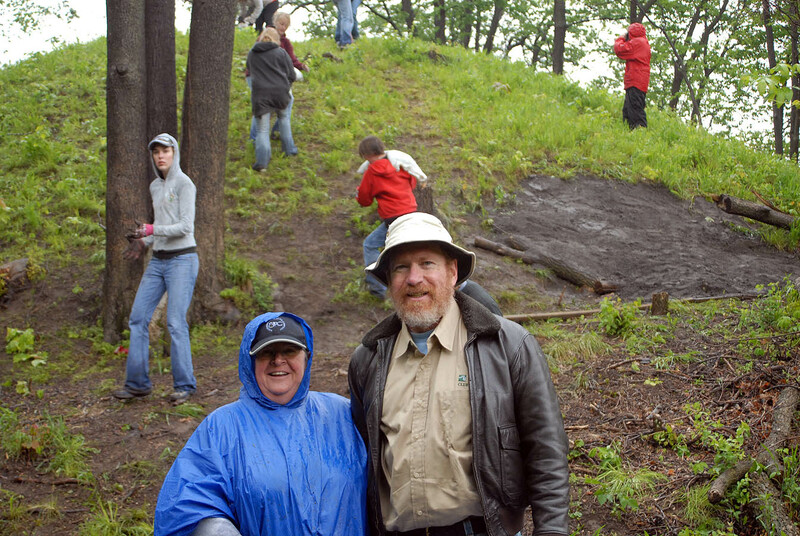 Blake Mound volunteers, April 21, 2006. Photograph by Mark Leach. 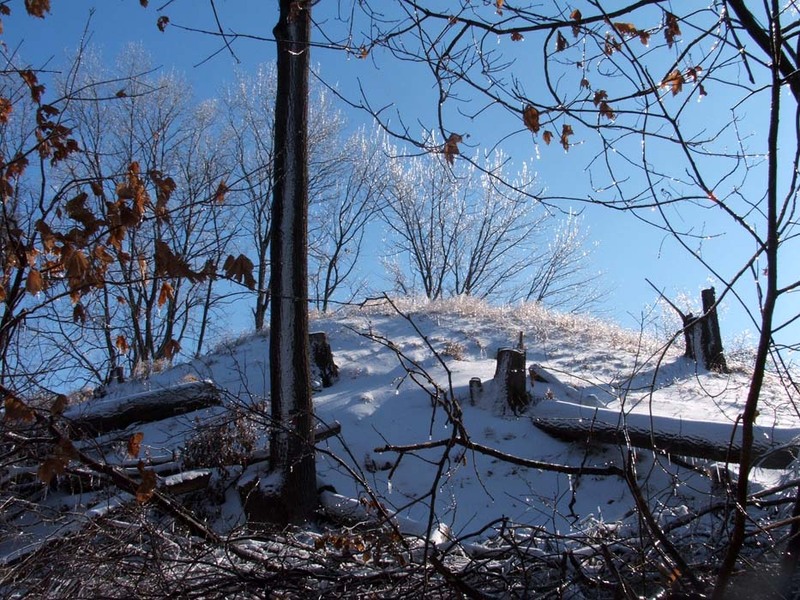 2005 Newly Named Blake's Mound at 23SL51 in West St. Louis County (Part 1). 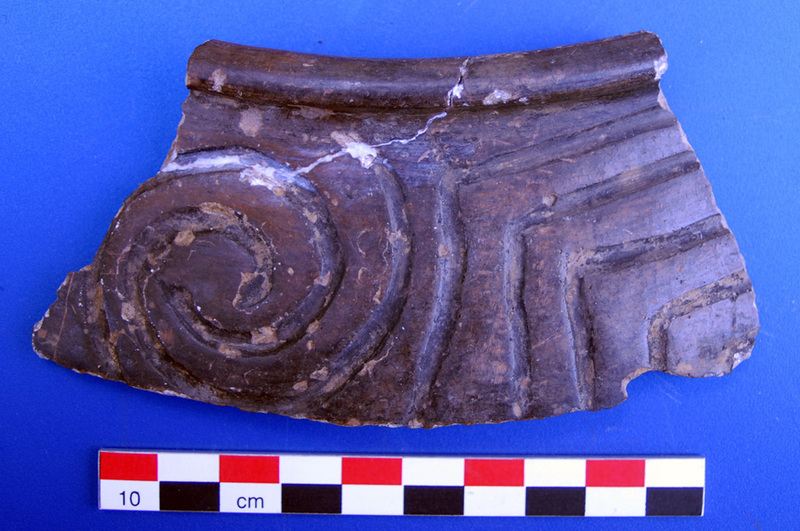 Missouri Archaeological Society Quarterly 22(3):17-19, 21.